Sewage problems lead to the most costly and difficult repairs. If you can choose a disaster to happen to your home, pick a dishwasher leak. Pick a burst outside pipe away from your house. Sewage problems rise to a whole new level, because of the risk involved in cleaning them up. When you have sewage problems, there are four things that happen right after one another. The first thing that you notice when sewage problems are brewing is that your water begins to drain slower. This is especially true of bathroom fixtures. Your toilet is the first to back up, and then your shower will also start draining more slowly. A backed up or clogged pipe makes it difficult for water to get out. Broken and leaking pipes might drain right away at times and not drain at other times. A burst pipe changes the pressure within your system. This can lead to intermittent problems flushing or draining. Extreme cases can even allow for reversed flow, water that should be draining is coming back up the pipes. This water will often be dark yellow to black in color. The darker the color, the worse the contamination. Your water back-flowing at all is a problem; if your water obviously discolored, you should call a plumber right away. What your sewage problem smells like will depend on what kind of sewage system you have. If your sewage is handled by city pipes, you’ll typically just get the smell of whatever backlog of sewage is there. If you have a septic tank, you’ll notice the smell of sewage and the smell of the chemicals that keeps your septic tank clear. This is typically a strong, abrasive smell, which makes it easier for you to notice. While the smell is a result of leaking pipes or back-flow from the pipes and happens after the slow drains, this is often the first sign of sewage problems that people notice. You’re going to need to call a plumbing company right away. If you suspect major damage, call your insurance company as well. 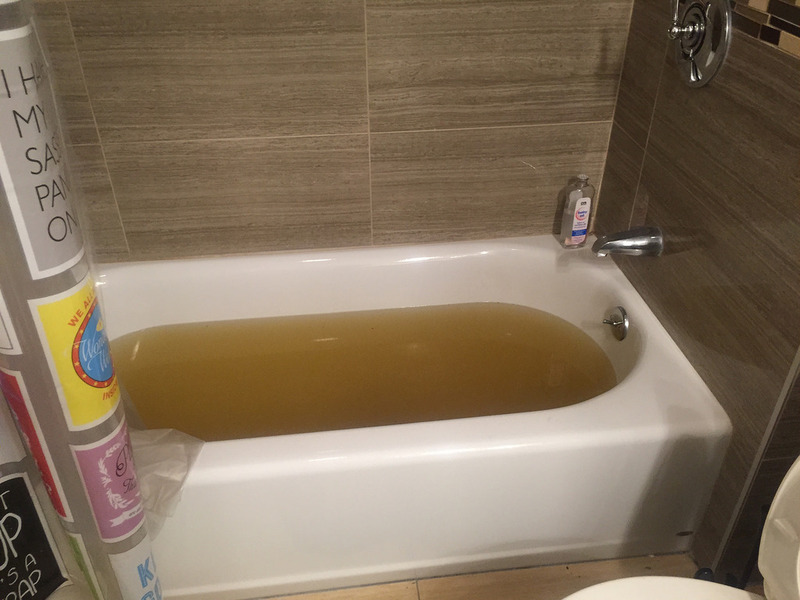 Once you’ve notice slow drains and the rotten smell that is associated with sewage problems, the entire area affected by the sewage is now contaminated. The level of damage depends on two things: how much the sewage contaminates and how long the contamination is allowed to sit. If your toilet dumps sewage onto the bathroom floor, immediately around the toilet, and you can clean it up (with gloves, mask, and heavy duty disinfectant) almost at once, you should be fine. Sewage pipes that break underground and leak sewage into your subbasement or under your lawn can poison a large area. After every other problem is sorted out, the last thing that happens is that repairs are costly. Things can get expensive very quickly. Water damage restoration services for sewage leaks is time consuming and resource heavy, which leads to a big bill at the end. It’s far better to avoid sewage problems than to pay for them afterwards. Get your pipes inspected yearly, and don’t write off any concerns that you have. If you’ve noticed a bad smell or slow draining, it’s better to get someone out there to check, just in case. Sewage problems shouldn’t wait.